Jorrit and Stan Pex will be back to CRG as they will partake in the forthcoming World Championship of Le Mans with the several times winner Italian make. 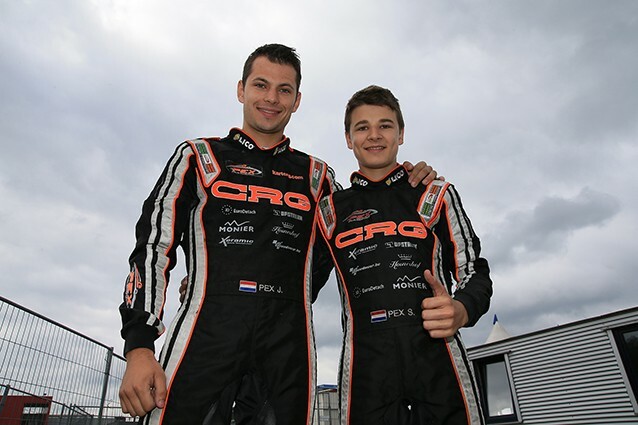 The two brothers Jorrit and Stan Pex will compete in the next KZ and KZ2 World Championship with CRG. The two very strong Dutch brothers will return to the important Italian make after a short experience with another brand early on in the season. During their career, Jorrit and Stan Pex obtained their greatest satisfactions with CRG and, at the eve of the World Championship to be held next 13 September in Le Mans, Team Pex Racing took the decision to bet again on the competitiveness of the victorious CRG chassis pushed by TM engines and on the technical assistance of Jos Verstappen. The most recent KZ World Championship won by CRG was secured by Max Verstappen in 2013 (who also won the European Championship in that year) with the engine support by the father of the current Formula 1 driver. Jorrit Pex and CRG won together the European KZ1 Championship and the WSK Euro Series in 2012, as well as four editions of the KZ2 German Championship, in 2011 on CRG-Maxter and in 2012, 2013 and 2014 on CRG-Tm. The youngest of the two brothers, Stan Pex, is at his second year in KZ2 and has already shown an important growth. Stan is currently tenth in the German Championship after three rounds. The two Pex brothers will debut on the CRG chassis next 6 September in Oschersleben’s fourth round of the German DKM Championship, where Jorrit Pex is currently holding the second position of the classification right behind the leader Davide Forè. The important appointment with the KZ World Championship and Super Cup KZ2 will take place only one week after in France at Le Mans.